N5325G in Bicentennial Colours at Seattle's Boeing Field. N5325G at Port Clinton, Ohio. C-FQND with Vancouver Island Air at CAE3 - Tyee Spit, Campbell River. • 57-6114. United States Army. Delivered 12-Feb-1958. Designated U-1A. Circa Jan-1962. Military Assistance Advisory Group (MAAG), Rome, Italy. Feb-1966. United States Mapping Mission to Ethiopia, based at Addis Ababa. Circa June 1969. At Coleman Barracks Depot, Mannheim, Germany. Aug-1969. Sharpe Army Depot, Stockton, CA. Jun-1975, Removed from Army inventory. • N5325G Civil Air Patrol (CAP). North Central Region. Poss. Based Ashland, NE. Circa Jul-1975. Canx Dec 1976. • N5325G Island Airlines, Port Clinton, OH. Regd Dec-1976. • N5325G Griffing Flying Service Inc. Port Clinton,OH. Regd Oct-1992. • C-FQND Delay River Outfitters Inc., dba Air Schefferville, Schefferville, QC. Regd 23-Aug-1993. Canx 18-Apr-1994. • C-FQND Waweig Lake Outfitters Ltd., Thunder Bay, ON. Regd. 18-Apr-1994. Canx 17-May-1994. • C-FQND Wilderness North Air Ltd., Milwaukee, WI. Based Thunder Bay, QC. Regd 18-Apr-1994. & 18-Apr-2000. Canx 06-Jun-2001. Power Plant: Converted to Vazar turbine by Recon Air, Geraldton, ON. • C-FQND 1401380 Ontario Ltd., (Wilderness North Air), Armstrong, ON. Operated by Waweig Air, Thunder Bay, ON. Regd 06-Jun-2001. Re regd 19-Sep-2003 & 24-Sep-2003. Canx 07-May-2004 & 07-May-2005. Regd 18-Apr 2006 at Thunder Bay as well as, 28-Sep-2006, 24-Nov-2006 & 14-Aug-2008. Canx 08-May-2010. Regd 18-Aug-2010. Canx 31-Oct-2013. • C-FQND Vancouver Island Air, Campbell River, BC. Regd 09-Dec-2013. Otter 233 was delivered to the United States Army on 12 February 1958 with serial 57-6114 (tail number 76114). It was one of sixteen Army Otters flown from Downsview to Addison, Texas for work on them by Collins Radio Corporation, to equip them for service overseas. Its initial unit allocation is unknown but it did serve in Europe, and was noted undergoing overhaul at the SABCA plant at Gosseleis near Brussels (who performed maintenance on US Army aircraft) during September 1960. By January 1962 it had joined the Military Assistance Advisory Group (MAAG), Italy based at Rome’s Ciampino Airport. It flew alongside a USAF C-47 which was also serving with the MAAG Flight. Kenneth Ketzler flew the Otter. Apart from trips to Brienne-le-Chateau, France for maintenance, all his flying was within Italy, often visiting Italian military bases where US supplied helicopters were being introduced and MAAG personnel were working with Italian Army aviation units on these helicopters. There were also VIP flights and personnel transportation, which took the Otter all over Italy, from the mountains in the north down to the Mediterranean. As he recalls: “Ice seemed to cause me more concern than anything else. I especially remember several times flying IFR between Florence and Bologna at the lowest altitude of 12,000 feet and seeing ice forming on the wings. Flying over large bodies of water on one engine is not exactly my cup of tea. Seemed like the engine always ran rough whenever there was a trip to the islands of Sicily or Sardinia”. 76114 continued in service with MAAG Italy until February 1966, when it headed south to a new posting with the United States Mapping Mission to Ethiopia, based at the “old airport” at Addis Ababa. For this tasking the Otter was re-painted from the standard olive drab it had flown in while in Italy to the white/red colour scheme used by Army aircraft on survey work. It joined some Beavers with the Mapping Mission (76143 and 82026), a Douglas C-47 (17203) and UH-1B Huey helicopters, all of which were engaged in a topographic survey of Ethiopia. The Ethiopian Army had received some Otters under a Military Air Program and they were also based at the same airfield, making it quite an important Otter base. The Otter was noted there in June 1969, just prior to its long flight north to Coleman Barracks, Mannheim, Germany from where it was transported to the Sharpe Army Depot, Stockton, California where it arrived in August 1969. After overhaul at the Depot it was assigned in March 1970 to the Aviation Section at Fort Ord, California used as a maintenance support aircraft. It remained in service at Fort Ord until June 1975 when its Army career came to an end. 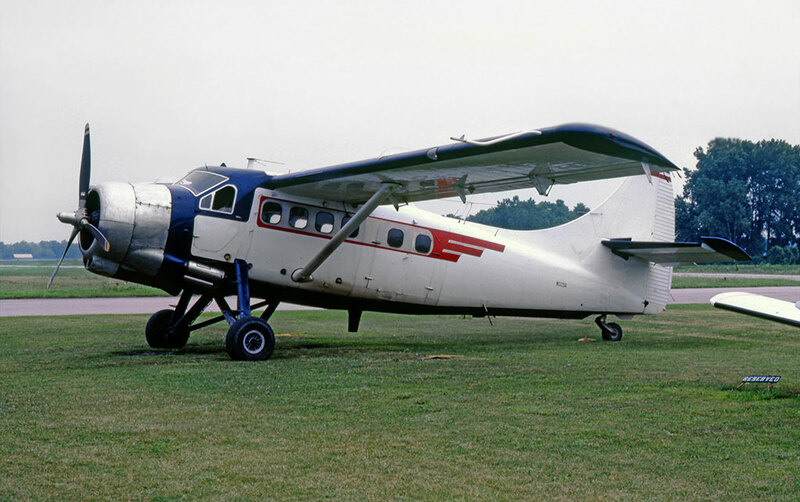 The Otter was transferred to the Civil Air Patrol (CAP) on 30 June 1975, registered that day as N5325G, and flown from Fort Ord north to Boeing Field, Seattle where Foreign & Domestic Enterprises prepared the Otter for service with the CAP. This was the company of Lloyd Rekow, who specialised in Otters. That master Otter rebuilder Harold Hansen was also involved. The Otter was surveyed on arrival at Boeing Field and found to be in excellent condition. Little work was required and on 16 July 1975 it received its Certificate of Airworthiness, with total airframe time of 3,776 hours. It was painted into an unusual colour scheme of blue top with white and red undersides and was noted as such at Boeing Field during August 1975. Its service with the CAP lasted little more than a year and by Bill of Sale 19 November 1976 it was sold to Eagle Aviation Inc., aircraft dealers of Jones-Riverside Airport, Tulsa, Oklahoma. It was sold on for $89,500 by Bill of Sale dated 2 January 1977 to Travelair Taxi Inc., doing business as Island Airlines of Port Clinton, Ohio. When it arrived at its new base at Port Clinton it was painted in a garish red, white and blue bi-centennial colour scheme, but was soon re-painted in the somewhat more attractive house colours of Island Airlines, which was white with a silver cowling, blue around the cockpit with a red flash behind the windows. It joined the other members of the Island Airlines fleet, Beaver N62352 and Ford Tri-Motor N7584. The Ford was used for sight-seeing flights but the Beaver and the Otter flew scheduled services from Port Clinton, located at the western end of Lake Erie, to islands in the Lake – Kelley’s Island, Put-in-Bay, Middle Bass and north Bass. This unique operation styled itself “The Shortest Airline in the World”, with some justification. Departing from Carl Keller Field at Port Clinton, the Otter took all of seven minutes to complete its scheduled flight to Put-in-Bay, and a similar time for the return sector. As Edward J. Rusch, the company’s Chief Pilot, said: “The Otter works the rough sod and stone fields of the islands very efficiently”. By March 1981 the Otter had a total time of 4,833 hours on the airframe. On the scheduled services to the islands, the Otter (or Beaver, depending on the load) carried the resident population year round; tourist during the summer as well as migrant Mexican labourers for fruit picking; and fishermen during the winter for ice fishing. The Otter also carried mail and freight and performed medevac flights, averaging several each weekend during the summer as tourists injured themselves. The island’s policeman acted as a paramedic and accompanied the flight. During the winter months when the lake froze over and the ferry no longer operated, these Beaver and Otter flights were the only means of access to the islands. After nearly 16 years of flying with the Otter, this unique operation came to an end. 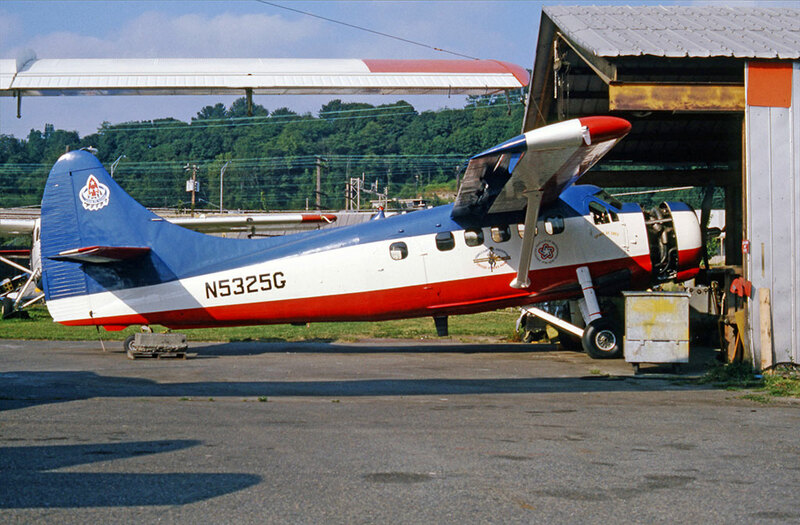 Island Airlines was taken over by Griffing Flying Service Inc of Port Clinton, to whom the Otter was transferred by Bill of Sale dated 23 September 1992, and to whom the Otter was registered the following month, still as N5325G. The scheduled services were terminated and the Otter put up for sale. The buyer, through brokers C&S Enterprises, was Delay River Outfitters Inc, trading as Air Schefferville to whom the Otter was registered C-FQND on 23 August 1993 and it set off for its new base of Schefferville in the remote bush country of northern Quebec. In 1994 the Otter was sold to Aircraft Investments LLC., of Oshkosh, Wisconsin and leased by them to Waweig Lake outfitters Ltd of Thunder Bay, Ontario to whom it was registered on 18 April 1994. It went to Recon Air at Geraldton, Ontario who converted it to a Vazar turbine Otter with a PT6A-135 engine, and it was repainted orange overall with a white cheatline and tail band. It then entered service with Waweig Lake Outfitters. For the next number of years the Otter would fly out of Waweig Lake during the summer months, carrying tourists, fishermen and hunters wishing to experience the delights of the Ontario bush country. This business was carried on by Waweig Lake Outfitters in association with Wilderness North Air of Milwaukee. By Bill of Sale 14 April 1997 Aircraft Investments LLC, owners of the Otter, transferred title to 3006298 Nova Scotia Company, but the lease to Waweig Lake Outfitters continued. The Otter continued to fly for Waweig Lake Outfitters and Wilderness North Air alongside turbine Otters C-GMLB (359) and C-FYCX (44). On 6 June 2001 Otter QND was registered to 1401380 Ontario Ltd., (Waweig Air) and continued its services in the Ontario bush country. Early in 2002 the Otter undertook a unique “Flight of Friendship” tour of 35 US cities, sponsored by Wilderness North Air. As the company’s website explained: “We wanted to show our friends in the US that they are welcome here in Canada during a period of uncertainty due to the attacks on the World trade Center. This is why we felt compelled to fly one of our Canadian icons, a turbine Otter, on this Canadian Hospitality Tour. At each of the 35 stops, presentations will be made by the Wilderness North Chief Pilot Randy Melnick of items donated by Canadian fire departments to their US counterparts, as a sign of solidarity and friendship. North West Ontario is renowned for its pristine wilderness environment and excellent recreational sports activities, said Alan Cheeseman, President of Wilderness North, who operate one of Canada’s finest fly-in fishing and adventure sports facilities. Wilderness North flies its guests into 16 different lakes and outpost camps from its base in Armstrong, Ontario just north of Thunder Bay”. Otter QND, on wheels, departed Thunder Bay on 8 January 2002 and returned at the end of March. Its routing on the tour was Thunder Bay-St.Charles, Illinois-Madison, Wisconsin-Chicago/Springfield-Indianapolis-Columbus-Cincinnati-Louisville-St.Louis-Springfield, Missouri-Memphis, Tennessee-Little Rock-Oklahoma City-Dallas (Love Field)-Houston-New Orleans-Tallahassee-Tampa-Orlando-Fort Lauderdale-West Palm Beach-Daytona Beach-Jacksonville-Savannah-Atlanta-Columbia-Charlotte-Richmond-Washington-Baltimore (Ocean City)-Philadelphia-New York (Teterboro)-Boston-Albany-Buffalo-Cleveland-Dayton-Detroit-Grand Rapids-Lansing-Kalamazoo-Cedar Rapids-Des Moines-Rochester-La Crosse-Minneapolis-Duluth-Thunder Bay. On completion of this extensive tour, QND resumed flying in the Ontario bush country, along with Otters C-GMLB and C-FYCX, for Waweig Air and Wilderness North Air, flying from Armstrong Lake and the nearby seaplane base at Waweig Lake. It is mentioned in a CADORS report for 8 September 2007. QND arrived at the Churchill, Manitoba water base but the pilot did not call down and clear after landing. The airport operator did a ground check to make sure the aircraft was down and safe. As the report shows, QND did not confine its operations to Ontario, also visiting such distant places as Churchill, Manitoba. In September 2010 Otter QND was advertised for sale, as having 12,130 hours total time and with an asking price of US $1,300,000. It was again advertised for sale in February 2013, price reduced to $1,250,000. The advert stated: “This aircraft is currently being run through the shop” and there were photographs of QND in a hangar having work done to it. 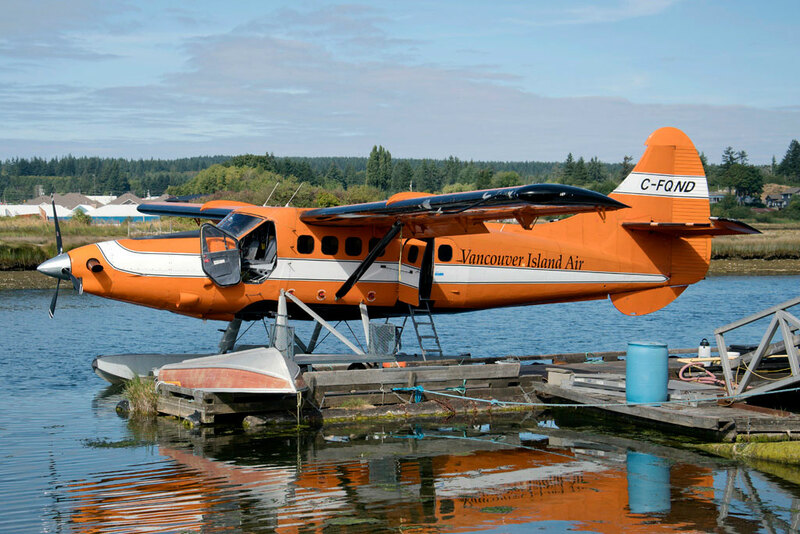 It flew again for Waweig Air/Wilderness North Air for summer 2013 but was sold at the end of the summer season, in September 2013, to Vancouver Island Air. In early October 2013 the Otter set off for its long delivery flight westwards, in the course of which an incident was recorded on CADORS on 4 October at La Ronge, Saskatchewan. On that day, Transwest Air DHC-6 Twin Otter C-FVOG on a local VFR flight out of La Ronge, reported seeing a DHC-3 Otter turning into him on finals for the La Ronge water base. The FSS had no information on the conflicting traffic. After landing the crew of the Twin Otter were able to identify the other aircraft as Otter QND and passed the information to the FSS. A few hours later the pilot of QND contacted the FSS and advised he had had radio failure inbound to La Ronge. QND was on straight floats and after La Ronge continued “lake hopping” across the country, eventually arriving at Campbell River on Vancouver Island, its new base. Registration of the Otter to 1401380 Ontario Ltd .,(Waweig Air) was cancelled on 31 October 2013 and C-FQND was registered to Vancouver Island Air Ltd., on 9 December 2013. 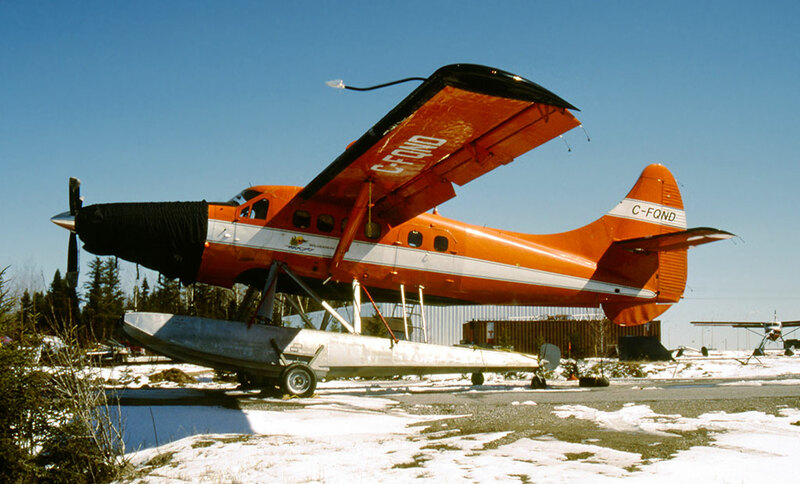 The Otter retained its orange overall colour scheme with white cheatline and tail stripe but acquired Vancouver Island Air fuselage titles. It replaced Beech 18 C-FGNR, which was sold, and joined Otter C-GVIX (97), these two turbine Otters from then on constituting the Vancouver Island Air fleet. Both Otters were still in service during summer 2017, flying the company’s charters and schedules out of Campbell River.